RVHS freshman Sierra Somerville swings away during a Tri-Valley Conference Ohio Division contest against Athens on May 1 in Bidwell, Ohio. A total of 15 players from the Ohio Valley Publishing area received all-league honors on the 2018 Tri-Valley Conference Ohio Division baseball and softball teams, as selected by the coaches within the seven-team league. Both the Marauders and Lady Marauders had five selections apiece, while River Valley earned five total honorees as three Lady Raiders and two Raiders were recognized. The Marauders tied for second in baseball had two repeat selections from a year ago in senior Zach Helton and junior Wesley Smith. Helton was also named the league’s offensive most valuable player. Senior Zayne Wolfe, as well as sophomores Briar Wolfe and Cory Cox, each received first-time selections to the TVC Ohio baseball squad. The Lady Marauders — which finished second out of seven teams with a 9-3 mark — had two repeat selections in senior Peyton Rowe and junior Taylor Swartz. Meigs also had three first-time recipients in sophomore Breanna Zirkle, freshman Jerrica Smith and freshman Chonslyn Spaun. River Valley ended the season seventh in baseball had one repeat selection in senior Jack Farley. The Silver and Black also had one first-time recipient in freshman Alex Euton. The Lady Raiders placed sixth in softball and received three first-time selections in senior Isabella Mershon, sophomore Airika Barr and freshman Sierra Somerville. There were a total of eight repeat selections to the All-TVC Ohio baseball squad, while seven repeat members were named to the softball squad. The first place Athens Bulldogs had the highest total of first-time selections with eight players named to the baseball squad, while the Lady Spartans led the softball squad with seven first-time honorees. ALEXANDER (11-1): Jadyn Mace (Fr) 1B; Abby Howard* (Sr) 2B; Erin Scurlock (Fr) C; Gracie Hill (Jr) P; Halie Miller (So) 3B; Audrey Ross (Fr) SS; Brooke Casto (Fr) CF. MEIGS (9-3): Taylor Swartz* (Jr) CF/C; Breanna Zirkle (So) P; Peyton Rowe* (Sr) 1B; Jerrica Smith (Fr) SS; Chonslyn Spaun (Fr) 3B. VINTON COUNTY (6-6): Darian Radabaugh* (Sr) C/3B; Shaylyn Reffitt (Sr) P/1B; Brooksanne Barnett (Sr) SS; Kelsey Ward (Sr) 2B/3B. WELLSTON (6-6): Ashley Compston* (Jr) P/1B; Kendra Coleman (Jr) C; Makenna Kilgour (Fr) 2B; Erica Scott* (Jr) CF. ATHENS (5-7): Gracie Casto (Fr) LF/P; Elianna Toppercer (Jr) 2B; Kaylee Stewart (Jr) P/SS. RIVER VALLEY (4-8): Isabella Mershon (Sr) OF; Airika Barr (So) P; Sierra Somerville (Fr) INF. NELSONVILLE-YORK (1-11): Taylor Shockey* (So) SS; Skylar Riffle (Fr) 1B. ATHENS (12-0): Nate Trainer (So) SS/P; Easton McCollum (Sr) LF; Rece Lonas (So) CF/P; Carson Baker (So) C; Eli Kennedy (Jr) 1B/P; Jack Cornwell (So) P; Drew Zorn (Sr) 3B/2B. ALEXANDER (7-5): Andy Merckle* (Sr) P/OF; Connor Kimbrough (Jr) C; Isaac York (Fr) P/INF; Dalton Skinner (So) P/INF; Ben Wolfe (So) P.
MEIGS (7-5): Zach Helton* (Sr) C/P; Zayne Wolfe (Sr) P/1B; Briar Wolfe (So) P/INF; Wesley Smith* (Jr) OF; Cory Cox (So) INF. WELLSTON (7-5): Michael Graham* (Sr) P/SS; Connor Bates* (Sr) C; Austin Sharp (Sr) CF; Zach Dress (Sr) 3B/OF; Hunter Cardwell (So) 2B/P. NELSONVILLE-YORK (5-7): Reece Robson* (Jr) C; Garrett Maiden* (Sr) SS/P; Shakim Williams (Sr) P/LF. VINTON COUNTY (4-8): Jeffery Harper* (Sr) P; Bailey Bartoe (Sr) SS; Ryan Grigsby (Sr) 2B. 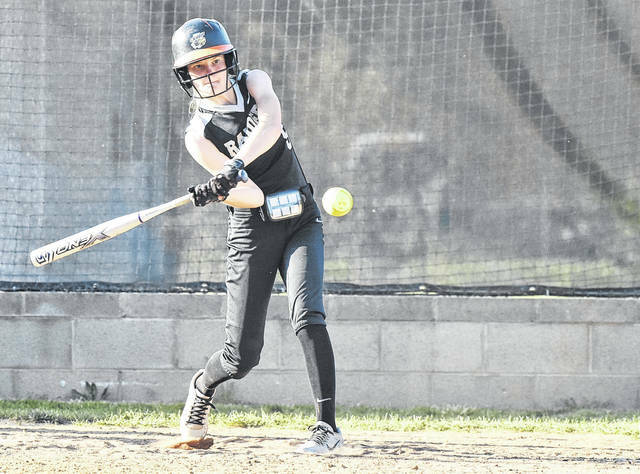 RIVER VALLEY (0-12): Jack Farley* (Sr) P; Alex Euton (Fr) C.
https://www.mydailytribune.com/wp-content/uploads/sites/42/2018/05/web1_5.28-RV-Somer.jpgRVHS freshman Sierra Somerville swings away during a Tri-Valley Conference Ohio Division contest against Athens on May 1 in Bidwell, Ohio.